Download "CFE 2. 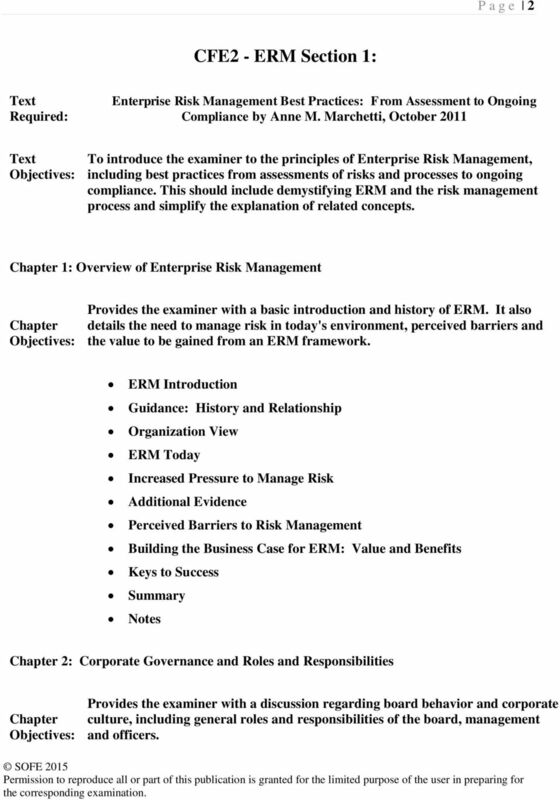 Enterprise Risk Management. 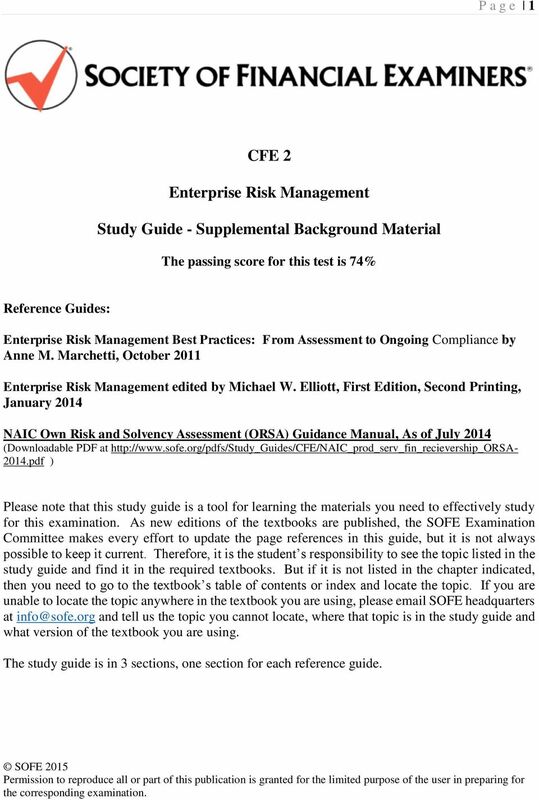 Study Guide - Supplemental Background Material"
1 P a g e 1 CFE 2 Enterprise Risk Management Study Guide - Supplemental Background Material The passing score for this test is 74% Reference Guides: Enterprise Risk Management Best Practices: From Assessment to Ongoing Compliance by Anne M. Marchetti, October 2011 Enterprise Risk Management edited by Michael W. Elliott, First Edition, Second Printing, January 2014 NAIC Own Risk and Solvency Assessment (ORSA) Guidance Manual, As of July 2014 (Downloadable PDF at pdf ) Please note that this study guide is a tool for learning the materials you need to effectively study for this examination. 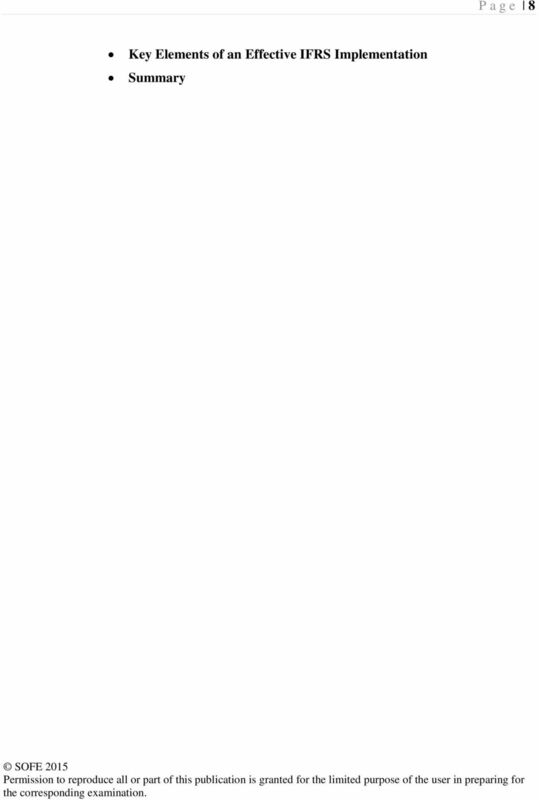 As new editions of the textbooks are published, the SOFE Examination Committee makes every effort to update the page references in this guide, but it is not always possible to keep it current. Therefore, it is the student s responsibility to see the topic listed in the study guide and find it in the required textbooks. But if it is not listed in the chapter indicated, then you need to go to the textbook s table of contents or index and locate the topic. If you are unable to locate the topic anywhere in the textbook you are using, please SOFE headquarters at and tell us the topic you cannot locate, where that topic is in the study guide and what version of the textbook you are using. The study guide is in 3 sections, one section for each reference guide. 2 P a g e 2 CFE2 - ERM Section 1: Text Required: Enterprise Risk Management Best Practices: From Assessment to Ongoing Compliance by Anne M. Marchetti, October 2011 Text To introduce the examiner to the principles of Enterprise Risk Management, including best practices from assessments of risks and processes to ongoing compliance. 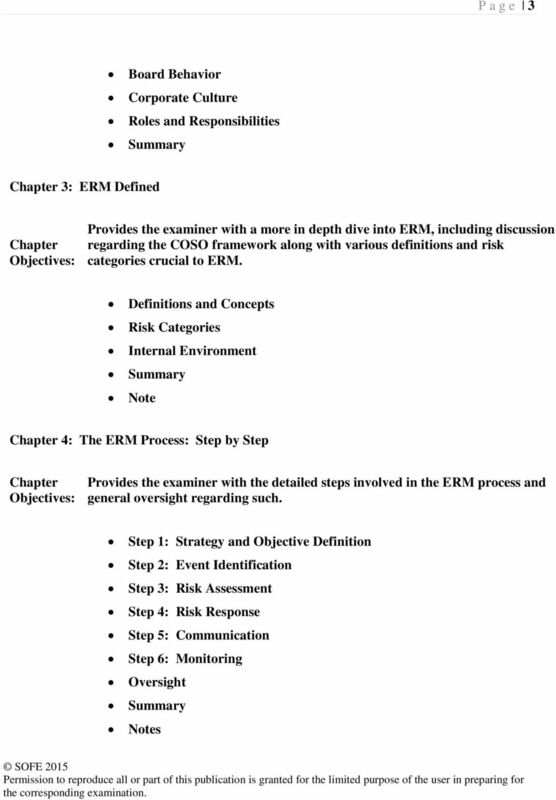 This should include demystifying ERM and the risk management process and simplify the explanation of related concepts. 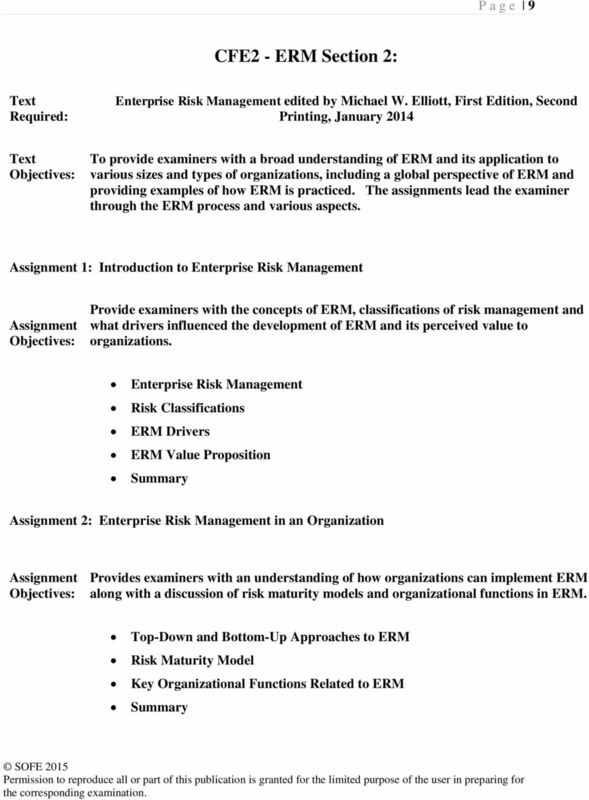 1: Overview of Enterprise Risk Management Provides the examiner with a basic introduction and history of ERM. It also details the need to manage risk in today's environment, perceived barriers and the value to be gained from an ERM framework. ERM Introduction Guidance: History and Relationship Organization View ERM Today Increased Pressure to Manage Risk Additional Evidence Perceived Barriers to Risk Management Building the Business Case for ERM: Value and Benefits Keys to Success Notes 2: Corporate Governance and Roles and Responsibilities Provides the examiner with a discussion regarding board behavior and corporate culture, including general roles and responsibilities of the board, management and officers. 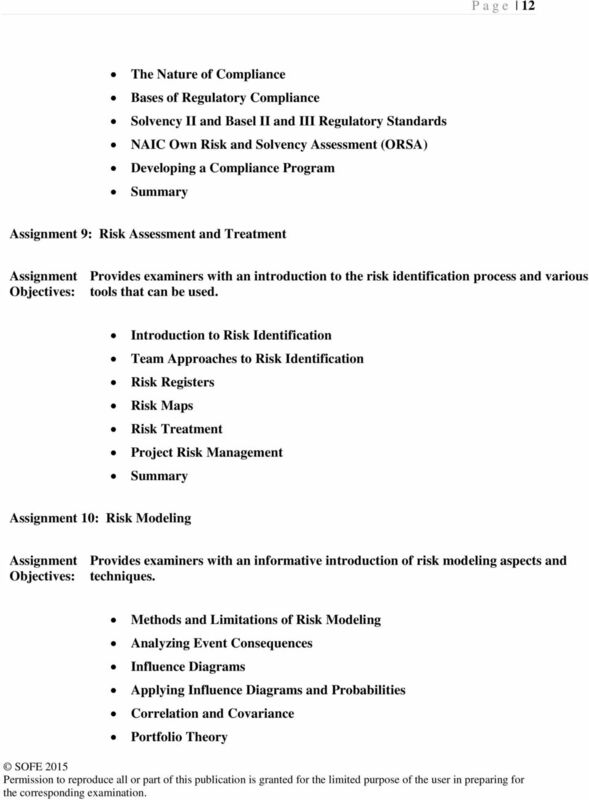 11 P a g e 11 Types of Business Strategies Strategic Risk Management Applying Strategic Risk Management 6: Risk-Based Performance and Process Management Provides examiners with knowledge regarding risk-based performance indicators and business process management. 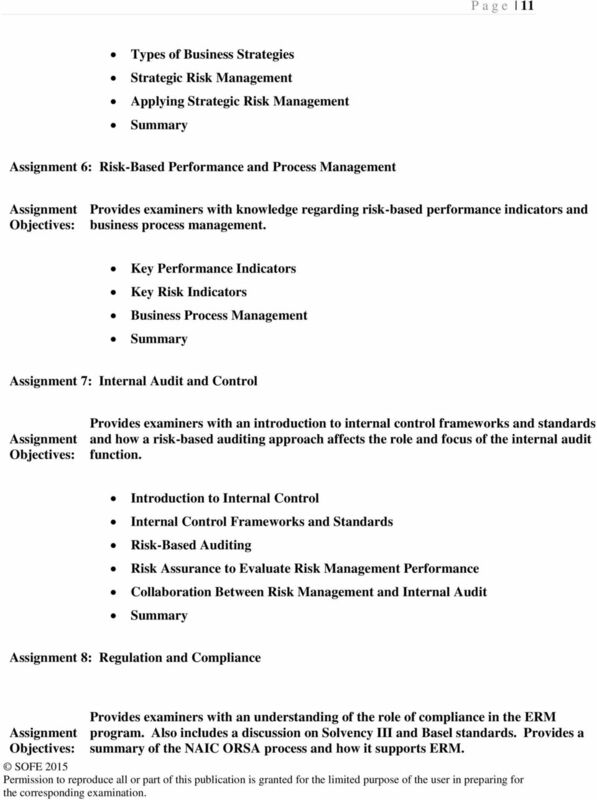 Key Performance Indicators Key Risk Indicators Business Process Management 7: Internal Audit and Control Provides examiners with an introduction to internal control frameworks and standards and how a risk-based auditing approach affects the role and focus of the internal audit function. Introduction to Internal Control Internal Control Frameworks and Standards Risk-Based Auditing Risk Assurance to Evaluate Risk Management Performance Collaboration Between Risk Management and Internal Audit 8: Regulation and Compliance Provides examiners with an understanding of the role of compliance in the ERM program. Also includes a discussion on Solvency III and Basel standards. 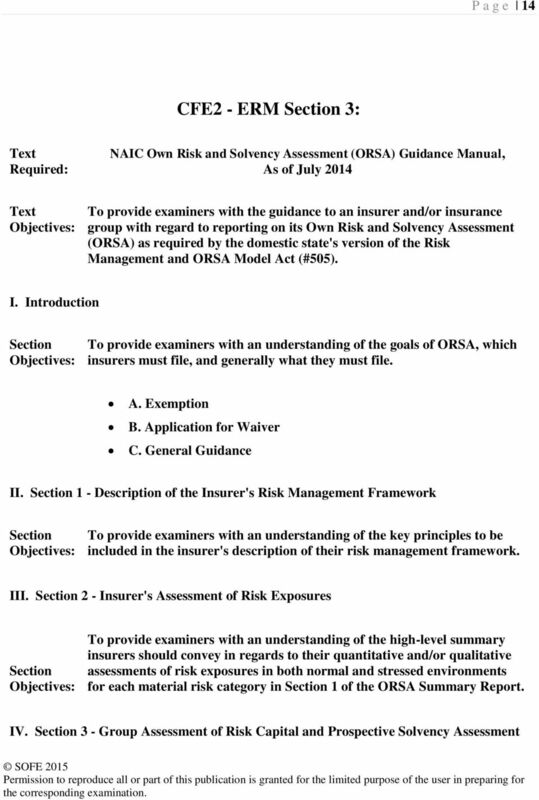 Provides a summary of the NAIC ORSA process and how it supports ERM. 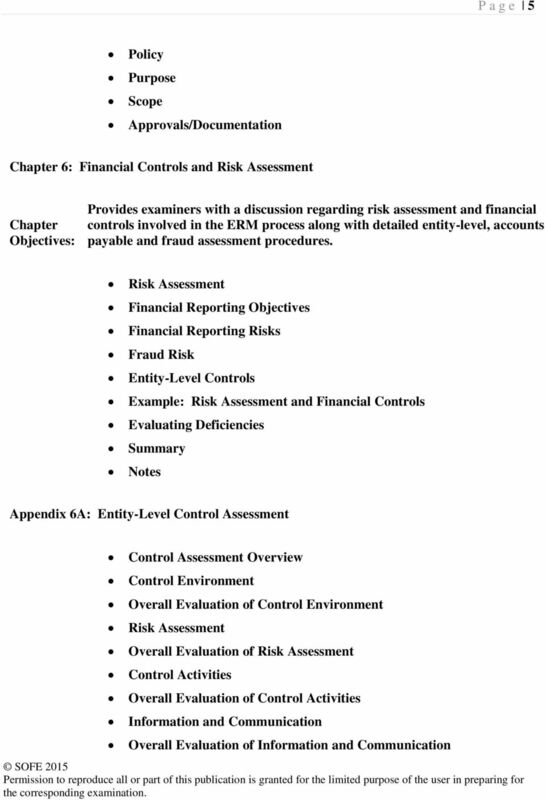 15 P a g e 15 Section To provide examiners with an understanding of how insurers should comply with Section 3 of the ORSA Report in regards to group assessment of risk capital and prospective solvency assessment. A. 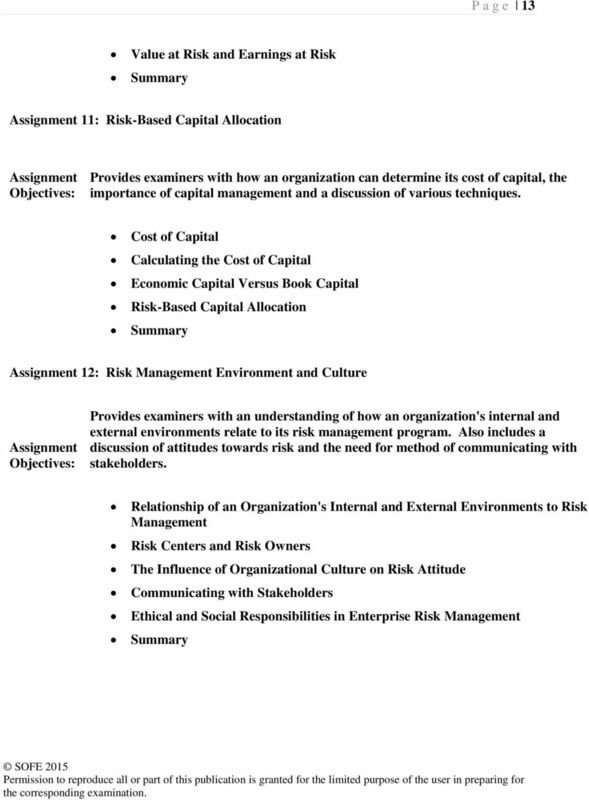 Group Assessment of Risk Capital B. 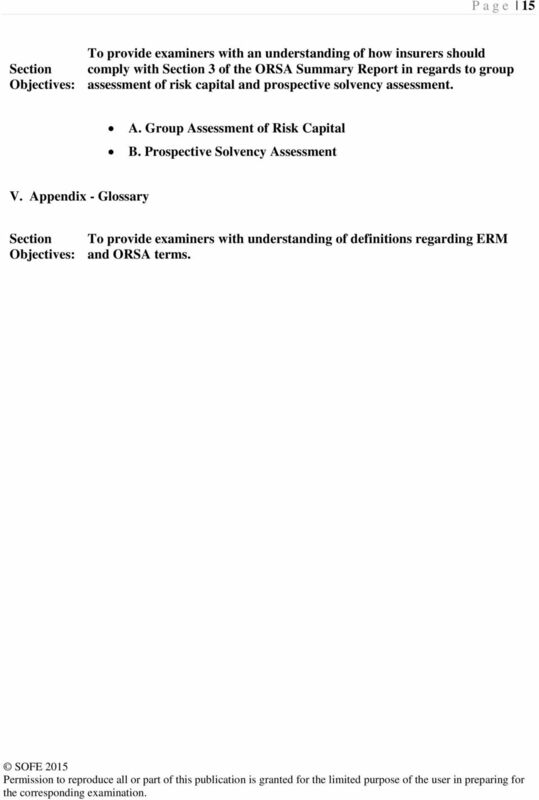 Prospective Solvency Assessment V. Appendix - Glossary Section To provide examiners with understanding of definitions regarding ERM and ORSA terms. Exams, Audit, SOX/MAR, ERM, ORSA,...what s next??? 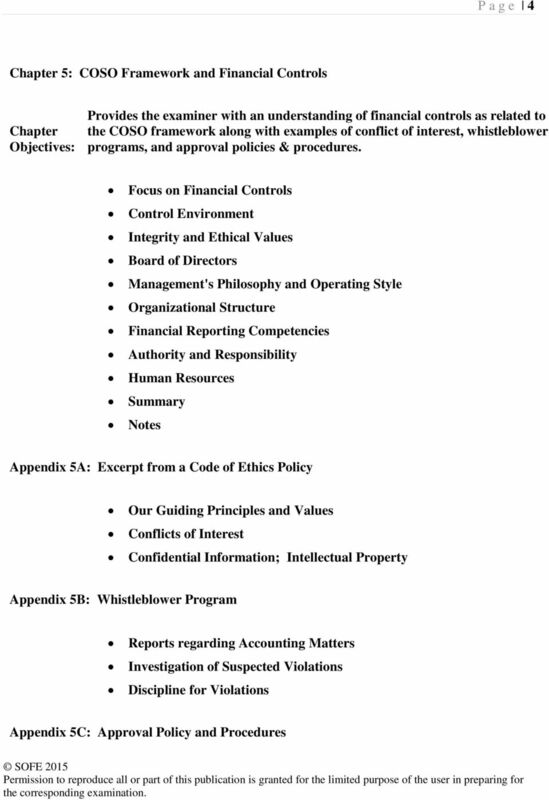 Sarbanes-Oxley Compliance Workbook. From Zero to SOX. 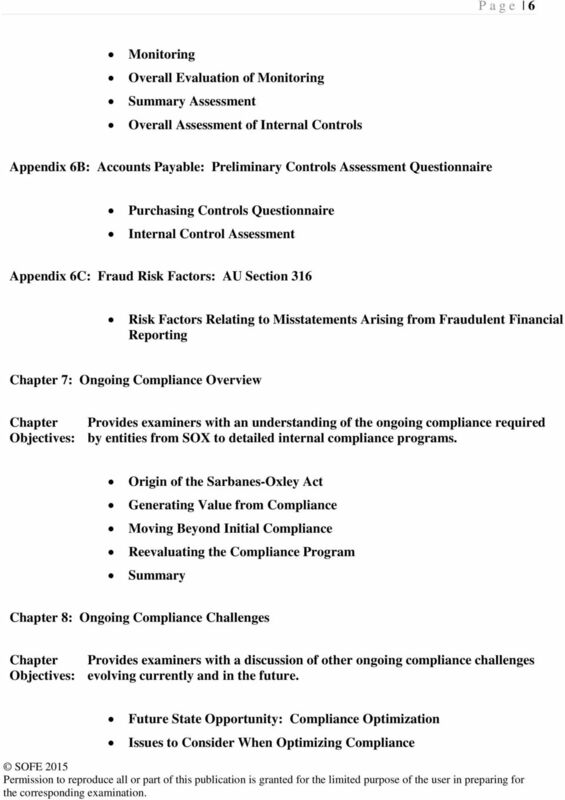 Sarbanes-Oxley Compliance Workbook. sensiba san filippo www.ssfllp.com sox@ssfllp. INSURANCE RISK MANAGEMENT ADVISORY SOLUTIONS Transforming risk management into a competitive advantage kpmg.com 2 Transforming risk management into a competitive advantage Assessing risk. Building value. Studies (by Equifax and others) have determined that over 90% of hospital bills contain errors most of which are overcharges. 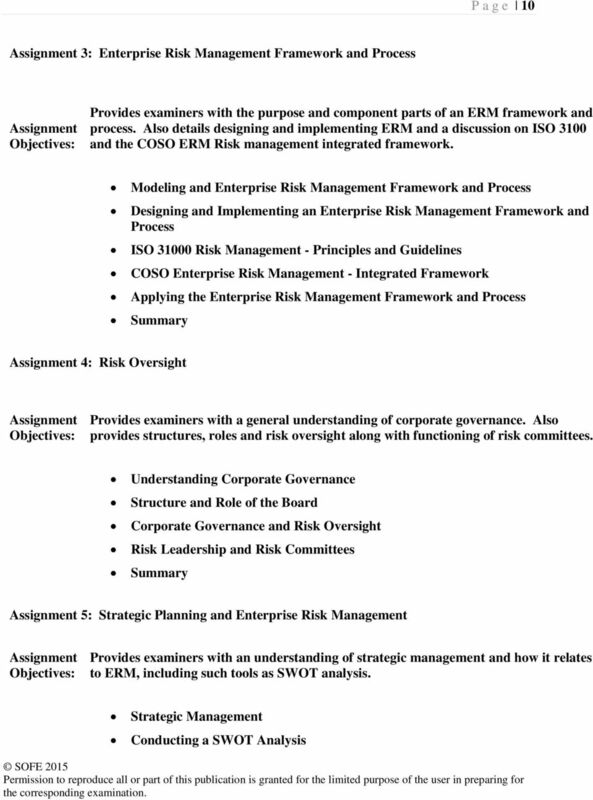 Brochure More information from http://www.researchandmarkets.com/reports/2220031/ COSO Enterprise Risk Management. Establishing Effective Governance, Risk, and Compliance (GRC) Processes. 2nd Edition.